The study shows eating 25 to 30 grams a day lowered the risk of early death. New research out Thursday shows that people who eat more fiber live longer. It takes a lot to have a strong effect, but people who ate between 25 grams and 29 grams a day of fiber were less likely to die during any given time period than people who ate less fiber, the team at the University of New Zealand found. People who eat that much fiber also weigh less, have lower blood pressure, lower blood sugar and lower cholesterol, they reported in the Lancet medical journal. 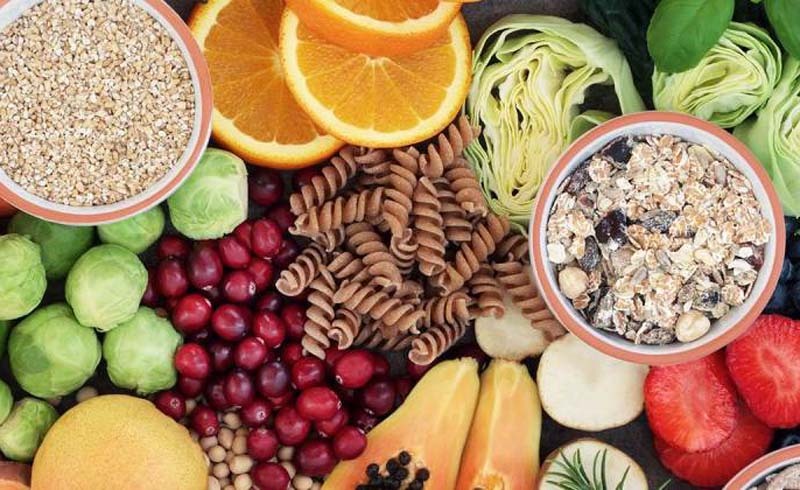 It’s not the first study to show that fiber is good for you, but it’s one of the largest and it shows that fiber alone is the important factor — whether it comes from fruit, vegetables, whole grains or beans. Jim Mann of New Zealand’s University of Otago and colleagues looked at studies from around the world, covering various types of research, including trials that randomly assigned people to eat different diets. They covered more than 4,600 people. 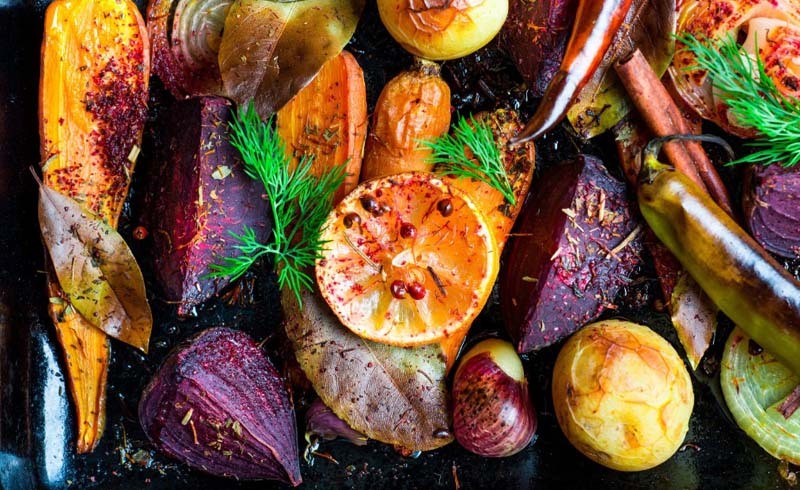 “Observational data suggest a 15–30 percent decrease in all-cause and cardiovascular related mortality, and incidence of coronary heart disease, stroke incidence and mortality, type 2 diabetes, and colorectal cancer when comparing the highest dietary fiber consumers with the lowest consumers,” they wrote. For every 8 gram increase of dietary fiber eaten a day, total deaths and incidences of coronary heart disease, type 2 diabetes and colorectal cancer decreased by 5 to 27 percent. Most people only get about 20 grams a day, they noted. They also looked at glycemic index — a measure of how food affects blood sugar and insulin. Glycemic index wasn’t a very good predictor of health or of early death, they noted. Most guidelines advise people to eat plenty of fruits, vegetables and whole grains and to cut back on fat and sugar. Given that fruits, vegetables and whole grains tend to be high in fiber while processed foods, meat dairy are low in fiber, that would help explain why plant-based diets are healthier. How hard is it to get to 25-30 grams of fiber a day? Beans and pulses are one short-cut. A cup of black beans delivers 15 grams of fiber, while a cup of baked beans has 10 grams. A cup of green peas have 9 grams of fiber. An apple eaten with the skin provides about 4.5 grams of fiber while an orange or banana provides 3 grams. A cup of broccoli has 5 grams while a baked potato provides 4 grams. Bread varies a lot, but the amount of fiber is listed on the label and it can vary between 1 gram a 4 grams a slice. 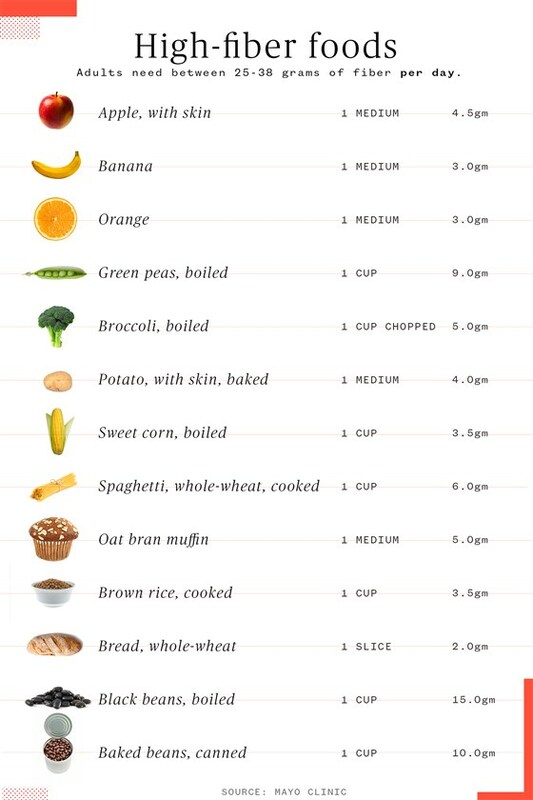 A cup of whole-wheat spaghetti offers 6 grams of fiber, while a cup of cooked brown rice contains 3.5 grams. In 2015, a team at the Harvard School of Public Health found that each average daily serving of whole grains lowered a person’s risk of dying from heart disease by 9 percent and lowered the overall risk of dying from anything by 5 percent over a quarter-century. Other studies have shown a high-fiber diet lowers the risk of breast cancer and helps people absorb fewer calories.